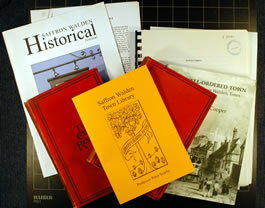 Searby, Peter : Saffron Walden Town Library - Saffron Walden : Saffron Walden Town Library Society, 2004. These are some of the books available concerning the Town Library. Peter Searby's book is available from the library counters, price £2.50.